Introduction to Geological Maps and Structures describes the basic methods to interpret and attain a better understanding of geological maps. 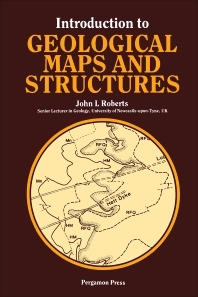 The book describes the nature and preparation of geological maps, and then covers topics such as solid and drift maps, geological boundaries, sections, and the use of symbols. The book explains sedimentary rocks, outcrop patterns, and the topographic representation of geological structures. The text also addresses the geometry of folds and folding when pre-existing surfaces are distorted into zigzag patterns. The author explains in detail the morphology of folded layers and the mechanism involved in folding. He goes on to interpret the formation of outcrop patterns, as well as the structure of a cylindrical and cylindroidal fold patterns. The author also describes the different structures that result from the brittle fractures present in rocks that undergo massive stress. Of interest is the presentation of how fissures and mineral veins are formed and deposited. The author then discusses earth movements resulting in angular unconformities known as stratigraphic break. These breaks in the stratigraphic record, such as diastems, non-sequences, paraconformities, or disconformities, can be interpreted as the intervals of geological time. The book then explains the nature of tectonic maps, which involves features arising from the continental crust, and how these maps are different from geological maps that show the outcrop of lithostratigraphic units. Geologists, cartographers, meteorologists, seismologists, land use developers, and students of the earth sciences will find this book valuable.